So Oscar has been doing a little better with the whole separation anxiety thing. I’ve been hanging on to 15 months because I hear that is the magic number for a lot of babies to grow out of it. Oscar will be 15 months on Monday (!!!) and it seems like each time we leave him he does better and better! This week we decided to keep him up a little late on Monday night so we could all attend our community group together. Jerry and I had been taking turns staying home with Oscar and that worked for a while, but we missed being able to engage in the discussions together. So we decided to see what would happen. Oscar did great! He played with Jude and even went upstairs to play in a completely separate room from us with another parent. Honestly, I never thought he would go for it, but up he went and we had a great discussion! Score one for Community Group! But if I am honest, I couldn’t get TOO excited about that because we were with people we know and love. Oscar is definitely more anxious around strangers so I knew the true test would be the YMCA. The past few times I have taken him he has been BESIDE HIMSELF with anguish, so we kinda backed off for a while. But this week, I wanted to try Zumba and Jessica was going to bring Jude so I knew he would at least have a familiar face in the nursery. He still cried when I dropped him off but apparently stopped soon after because he was totally happy to see me when I picked him up and they said he did great! YAAAAAY!! This is so so SO huge for me. I really want him to enjoy his time there and the interaction with the other kids while I can get a workout in. Less guilt = better workout. Other than Jude, there is one more common denominator in the success of these two trips. 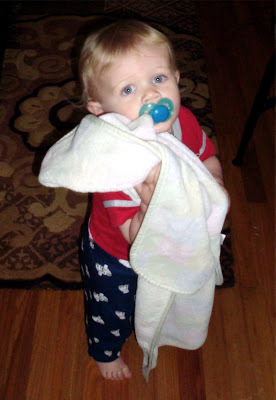 And that is the fact that I allowed him to bring blanket and paci. Normally, these are nap/bedtime only props but I decided to see what would happen if I let them come along. I think it really helped him feel grounded when I wasn’t with him! I wish i had a smaller blanket because his drags everywhere, and let’s face it, I should probably phase out the paci sooner than later. BUT these things are working and this is one area where I couldn’t care less what the experts say! Blanket and paci for the win! We are still dealing with major separation anxiety with our 14 month old. He has no problem being away from Daddy, but Mommy cannot leave the room at all! 1 more month you say? I hope so! He doens't even do well at Grandma's for more than 15 minutes before he's looking around for me and crying. Therefor Mommy has not had a break in a very long time! Yay for Oscar finally getting there! Nathan's turn now! That is just the cutest picture…from the expression on his face right on down to his sweet little baby feet…just the cutest! Hooray for Oscar. I still have separation anxiety when I'm in a new place. Sometimes a familiar face and comfy blanket will do the trick. I think age 1 is so hard! They know enough to realize they miss you/they aren't happy with their surroundings, yet aren't old enough to really understand the "why" of it all. Hi, I also like the Madagaskar movies, super animation!